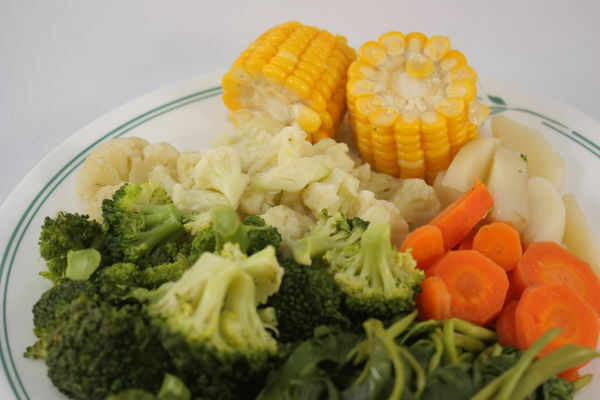 Steamed vegetables are a nutritious and quick choice for any dinner table. There are several methods to choose from, and you don't need any fancy kitchen equipment to get the job done. To get going on tonight's delicious, nutritious, colorful dinner, you'll need a steamer, covered pan, or microwaveable bowl. 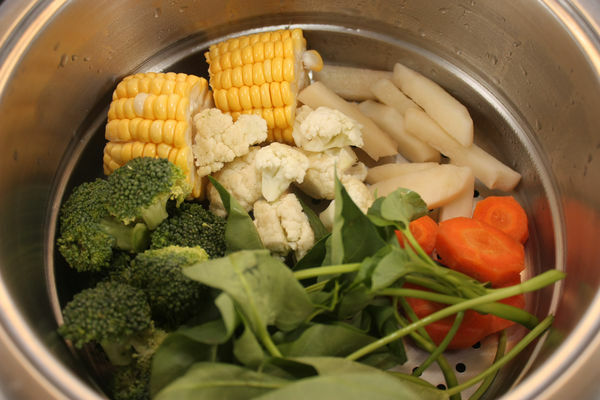 Before you cook your vegetables, it’s important to rinse them to wash away dirt, bacteria, and traces of pesticides. Rinse your veggies in clean, cold water, then pat them dry with a paper towel. Use a clean vegetable brush to scrub veggies with thick skins, like potatoes or carrots. Some veggies, like cauliflower and cabbage, have lots of nooks and crannies where dirt and bacteria can hide. Soak veggies like these in cool water for 1-2 minutes before rinsing them off. You can use a commercial produce wash if you like, but studies have shown that this is no more effective than rinsing your veggies in clean water. While certain greens are easy to just get out of the fridge, give a quick rinse-down, and toss in the pan, some need additional preparation. Large vegetables will steam faster if you cut them up, and some vegetables may have stems, seeds, leaves, or tough outer skins that need to be removed before you cook them. Tip: Most vegetables don’t needto be peeled before cooking. Infact, many peels add extra fiber,flavor, and nutrients to yourveggies. Try to stick to peelingthose veggies that have extratough or dirty skins.Tip: Most vegetables don’t need tobe peeled before cooking. In fact,many peels add extra fiber, flavor,and nutrients to your veggies. Try tostick to peeling those veggies thathave extra tough or dirty skins.Tip: Most vegetables don’t need to bepeeled before cooking. In fact, many peelsadd extra fiber, flavor, and nutrients toyour veggies. Try to stick to peeling thoseveggies that have extra tough or dirtyskins.Tip: Most vegetables don’t need to be peeled before cooking. In fact,many peels add extra fiber, flavor, and nutrients to your veggies. Tryto stick to peeling those veggies that have extra tough or dirtyskins.Tip: Most vegetables don’t need to be peeled before cooking. In fact, manypeels add extra fiber, flavor, and nutrients to your veggies. Try to stick topeeling those veggies that have extra tough or dirty skins. Carrots take much less time the smaller you cut them up; the same goes for cauliflower and potatoes. Some vegetables, like asparagus, may need a little extra preparation. For example, you will likely want to snap off the tough bottom ends of the asparagus stalks, and thicker stalks will be more tender if you peel them lightly before steaming them. Since some veggies take longer to steam than others, it’s a good idea to keep them separate when you cook them. That way, you won’t end up with some vegetables that are limp and soggy, while others are still crunchy and raw in the middle. You can cook different types together, but you may need a way to keep them separate in the steamer so you can easily remove the faster-cooking vegetables as soon as they’re done. For example, potatoes will take much longer to steam than green beans, so it’s best not to mix them up while you’re steaming them. 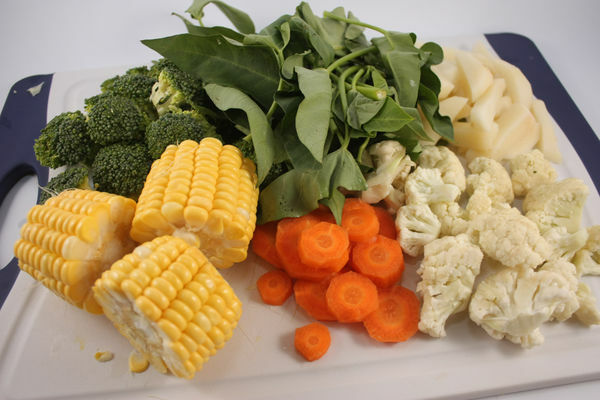 You can also speed up the cooking time of denser vegetables by cutting them up into smaller pieces. Begin by bringing 2 cups (0.47 L) of water to a boil over high heat. Once the water begins to boil, close the steamer to allow its internal temperature to build. To close the steamer, simply put the lid on the top pan, which is resting on the lower pan filled with water. This is similar to a double boiler or bain-marie. Some steamers may require more or less water, depending on the size of the pans. 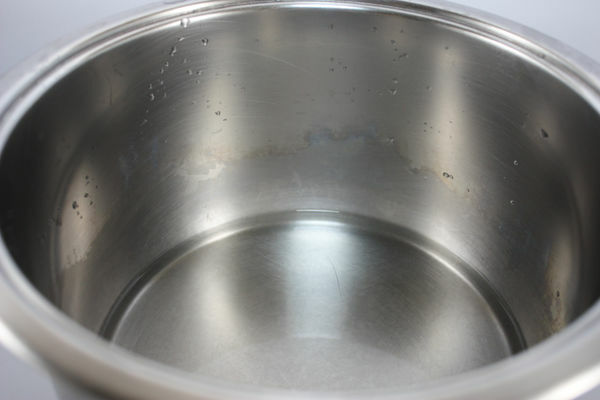 As a general rule, the water in the bottom pan should be 1–2 inches (2.5–5.1 cm) deep and should not reach the vegetables in the steamer basket. After the water begins to boil and steam, add your chosen vegetables, prepared and ready to go. Put the lid back on the steamer and reduce the heat to medium. Did you know? There are manytypes of steamers on the market.Some come with multiple steamingcompartments so you can easilyseparate the slow-steamingvegetables from the ones thatcook more quickly.Did you know? There are many types ofsteamers on the market. Some come withmultiple steaming compartments so youcan easily separate the slow-steamingvegetables from the ones that cookmore quickly.Did you know? There are many types ofsteamers on the market. Some come withmultiple steaming compartments so you caneasily separate the slow-steaming vegetablesfrom the ones that cook more quickly.Did you know? There are many types of steamers on the market. Some comewith multiple steaming compartments so you can easily separate theslow-steaming vegetables from the ones that cook more quickly.Did you know? There are many types of steamers on the market. Some come withmultiple steaming compartments so you can easily separate the slow-steamingvegetables from the ones that cook more quickly. If you’re steaming different kinds of vegetables, make sure to keep them in separate groups; this will make them easier to remove when they finish, as each one cooks at a different rate. To protect your hands from the steam, pour the vegetables in from a bowl instead of putting them into the steamer with your hands. You can also protect your hands by wearing oven mitts or covering them with a dish towel. Once you place the vegetables in the steamer, allow them to cook for a few minutes without disturbing them. Wait until they’ve been steaming for close to the minimum recommended time before you check on them. If you’re worried about losing track of the time, set a timer. For most fast-cooking vegetables, you can start checking in at around 3 minutes. 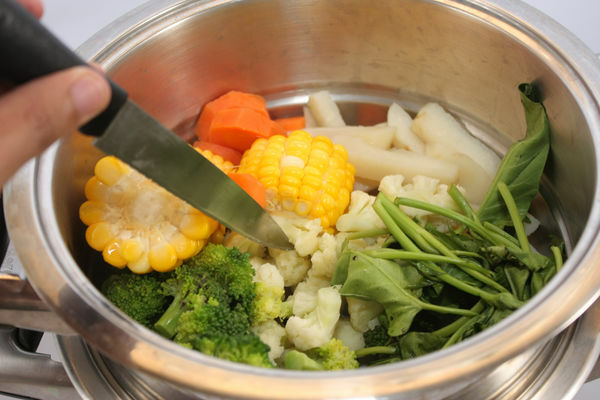 Once you think your veggies might be getting close to done, open the steamer and poke the thickest part of the vegetables with a knife or fork. If it’s easy to pierce them, they are probably about done. If not, let them steam for another 1-2 minutes before you check again. Smaller pieces will steam more quickly than bigger ones, and some vegetable types steam more quickly than others. For example, green beans, cauliflower florets, or asparagus stalks will steam faster than potatoes or whole baby carrots. If you’re cooking vegetables of multiple types or sizes, remove the ones that are done and let the others continue to steam. 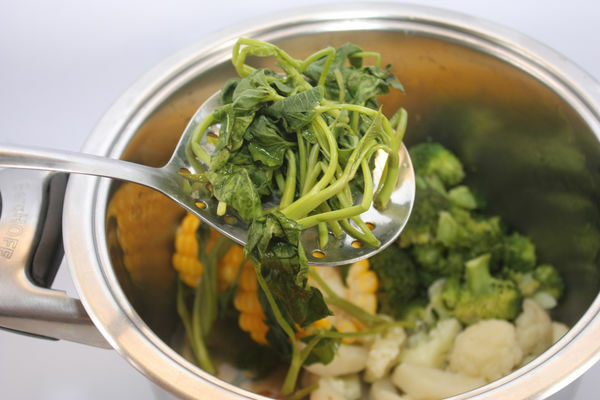 Use tongs or a slotted spoon to take the vegetables out of the steamer without burning yourself. Whenever your vegetables are done, move them to a covered dish to keep them warm. If all your vegetables are done at once, you may be able to simply lift the entire steamer basket out of the pan and dump them directly into a bowl or serving dish. Use oven mitts or a kitchen towel to protect your hands. Many vegetables will appear more vibrant or colorful once they’re cooked. Of course, the best test is a taste test. Your vegetables should be firm but tender rather than mushy. Transfer all your steamed vegetables onto a serving platter. Season them to taste with olive oil, salt, and pepper, and add a splash of lemon juice for some extra zip. Your vegetables are now ready to serve. 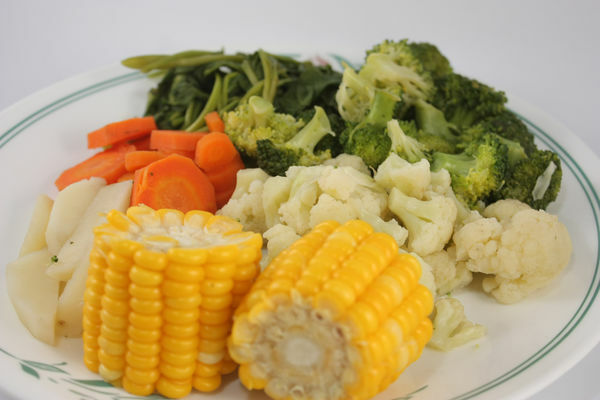 Steamed vegetables go wonderfully with any meat, can be served with a cheese or herb sauce, or even just as they are. Since steaming is so healthy, it is best not to load them up with too many extra fixings—they are delicious and nutritious as-is! It needs to be big enough for all your vegetables. Make sure it also has a matching lid or a lid that will sufficiently keep in the steam. Preferably, the pot should be big enough that you can fill it up ¾ of the way with your vegetables, which will leave room at the top for steam and condensation to build up under the lid. 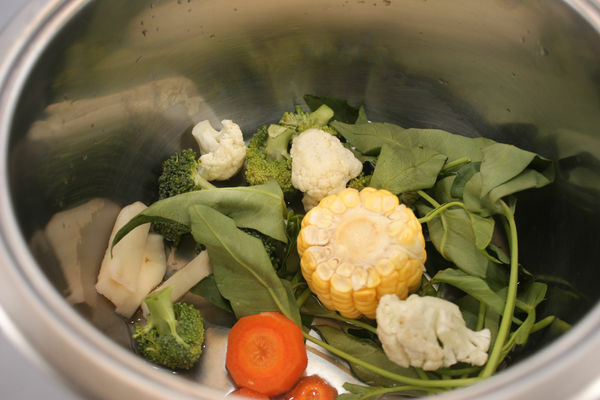 If you’re cooking larger vegetables, a deep pot or pan will work best. However, for smaller veggies—such as asparagus stalks or broccoli florets—you can do this in a large, lidded frying pan. 5 inches (1.3 cm) of water to the bottom of the pan. This will create the steaming effect but is not enough to boil all the nutrients out of the vegetables. The shallow layer of water will also protect the vegetables from burning at the bottom of the pot. 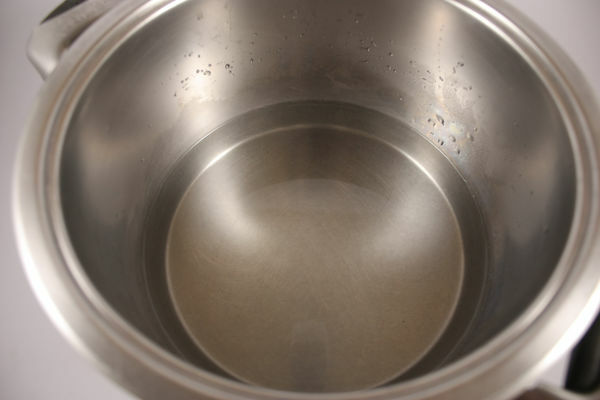 If the lid of your pot doesn’t fit tightly enough to seal in all the steam, you may need to use a little more water. Experiment with different amounts until you figure out what works with your pot. If you’re cooking multiple types of vegetables, put the longer-cooking veggies on the bottom. Layer those with a shorter cooking time on top. That way, you can easily remove the fastest-cooking vegetables first. For example, you might put a layer of potatoes on the very bottom, followed by cauliflower in the middle, then asparagus on top. Once the vegetables are in place, cover the pot securely and turn on the heat. Choose a medium-high setting rather than the highest setting. Touch the lid of the pot occasionally to test the heat. Once it’s too hot to touch, that means that the water is steaming. Resist the urge to lift the lid and check for steam, since this will release heat and disrupt the cooking process. 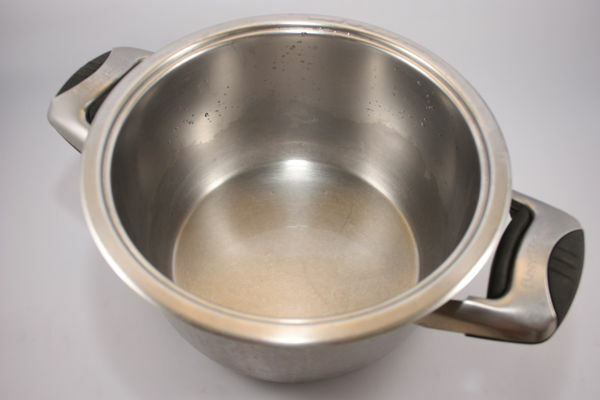 If you don’t want to risk burning your fingers on the hot lid, choose a pot with a glass lid so that you can look inside and see the water boiling and steaming. If you must, you can also crack the lid open for a split second and see if any steam escapes. Once the water starts steaming, turn the burner down to a low heat setting. Let your vegetables cook for the minimum recommended time for their size and type, then check them for doneness by inserting a knife into the thickest part of the vegetable. Your vegetables should be tender, but still have a little crunch. They should also appear vibrant and colorful. If they need more time, replace the lid and give them another 1-2 minutes before testing again. Once your vegetables are done, take them out of the pot and serve them however you like. For example, you could drizzle them with a cream sauce or toss them in olive oil and a few seasonings. Eat them alone or serve them up as a side with any main dish. Tip: You probably won’t havemuch water left over after usingthis method. If you do, though,you can incorporate it into avegetable broth or even use it towater your houseplants—they’ll appreciate theextra nutrients!Tip: You probably won’t have muchwater left over after using thismethod. If you do, though, you canincorporate it into a vegetable brothor even use it to water your houseplants—they’ll appreciate theextra nutrients!Tip: You probably won’t have much waterleft over after using this method. If youdo, though, you can incorporate it into avegetable broth or even use it to water yourhouse plants—they’ll appreciate theextra nutrients!Tip: You probably won’t have much water left over after using thismethod. If you do, though, you can incorporate it into a vegetable brothor even use it to water your house plants—they’ll appreciate theextra nutrients!Tip: You probably won’t have much water left over after using this method.If you do, though, you can incorporate it into a vegetable broth or even useit to water your house plants—they’ll appreciate the extra nutrients! 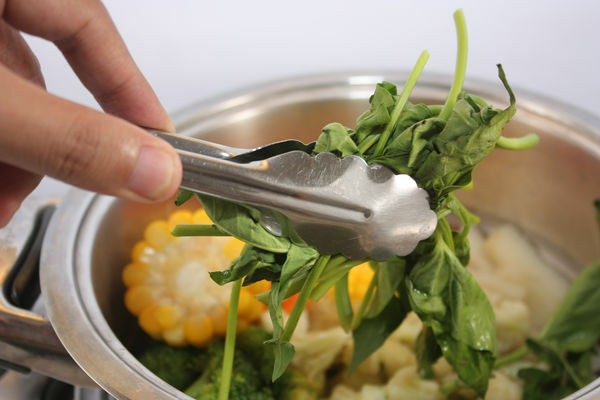 To protect your fingers, use tongs or a slotted spoon to take your vegetables out of the pot. If the veggies are all done at the same time, you can pick up the whole pot with a pair of oven mitts or pot holders and dump the contents into a strainer. If not all of your vegetables cook at the same rate, you may need to set the faster-cooking vegetables aside in a covered container to keep them warm until the rest are done. You don’t need much water to steam veggies in a microwave. In fact, you may be able to get away with just rinsing your vegetables and dumping them into the bowl without draining them. 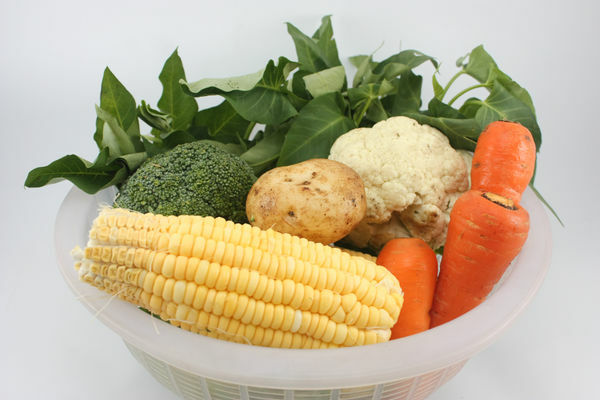 2–3 tablespoons (30–44 mL) of water per 1 pound (0.45 kg) of vegetables works well for most vegetables. If you're working with denser vegetables, you may need a bit more water. Some microwave gourmets recommend simply laying your vegetables out on a plate and covering them with 3 damp paper towels to provide all the necessary moisture. 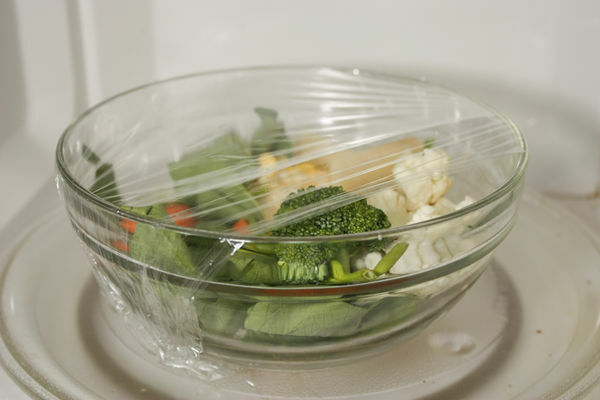 Stretch plastic wrap across the top of the bowl and turn back one corner to create a small vent. The wrap will retain the heat and moisture while allowing just a little extra steam to escape. Just make sure the plastic wrap you use is labeled “microwave safe.” The other 3 sides should be tight, sealing in the heat. It just needs the one corner to act as a vent. Alternatively, you can cover the bowl with a ceramic plate or a vented lid designed to fit the bowl. 5 minutes. If that doesn’t do it, continue in 1-minute long intervals. Each vegetable is a bit different and so is each microwave. 2 and 1/2 minutes is a good starting point for checking. Did you know? Contrary to popularbelief, cooking your vegetablesin a microwave will not reducetheir nutritional value. In fact,steaming your veggies in amicrowave is one of the best waysto preserve those valuablenutrients, as opposed to othercooking methods like boiling,pressure cooking, or frying!Did you know? Contrary to popularbelief, cooking your vegetables in amicrowave will not reduce theirnutritional value. In fact, steamingyour veggies in a microwave is one ofthe best ways to preserve thosevaluable nutrients, as opposed toother cooking methods like boiling,pressure cooking, or frying!Did you know? 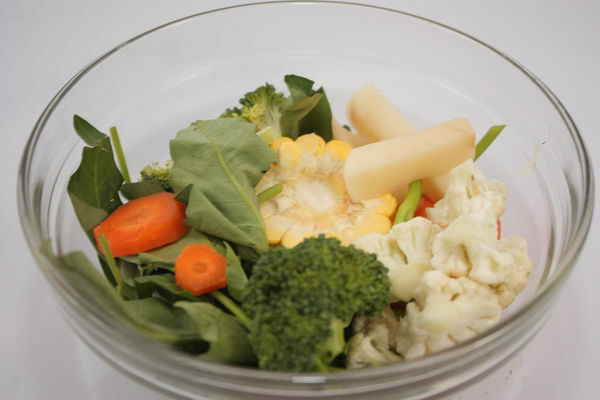 Contrary to popular belief,cooking your vegetables in a microwave willnot reduce their nutritional value. In fact,steaming your veggies in a microwave is oneof the best ways to preserve those valuablenutrients, as opposed to other cookingmethods like boiling, pressure cooking, orfrying!Did you know? Contrary to popular belief, cooking your vegetables in amicrowave will not reduce their nutritional value. In fact, steamingyour veggies in a microwave is one of the best ways to preserve thosevaluable nutrients, as opposed to other cooking methods like boiling,pressure cooking, or frying!Did you know? Contrary to popular belief, cooking your vegetables in amicrowave will not reduce their nutritional value. In fact, steaming yourveggies in a microwave is one of the best ways to preserve those valuablenutrients, as opposed to other cooking methods like boiling, pressure cooking,or frying! The cooking time will depend on both your vegetables and the power of your microwave. Some may be done in a couple minutes, while others will take considerably longer. Your veggies are done when they’re easy to pierce with a knife but are still a little firm. 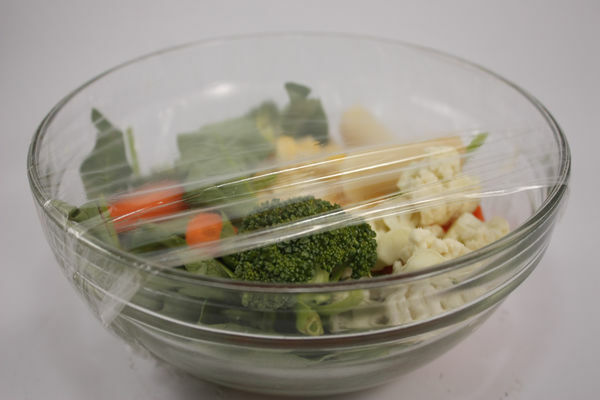 Remove the plastic wrap, toss it in the trash, and place the vegetables on your dinner plate. Add some seasonings or sauces to taste and enjoy! If you want, you can add a little butter or soy sauce to your veggies before you start steaming them. Once they’re done, add salt and pepper or any other seasonings of your choice. Be careful taking off the plastic wrap or lid, since doing so will release a lot of very hot steam.